Last December, high winds caused a stage in Brazil to collapse in the middle of a music festival. The DJ performing at the time was tragically killed and several concertgoers were injured. 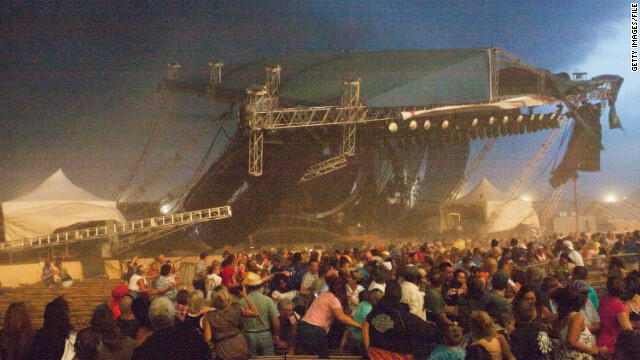 For Elite Multimedia Rigging Manager Trey Merritt, this disaster was reminiscent of the 2011 Indiana State Fair in which seven people were killed by a similar stage collapse. While the collapse in Indiana was truly a tragedy, it has led to significant changes in event safety in the United States. The previous mindset of making the show happen regardless of weather has been replaced with a focus on safety, and precautions taken in the preparation leading up to events have changed. Both legal measures taken by OSHA and recommendations by groups such as the Event Safety Alliance, of which Merritt is a member, have been shaped through a thorough analysis of what went wrong. The synthetic webbing straps and wire rope guy lines that were used, for instance, did not have the necessary strength to resist the 59 mph wind gut that hit the stage rigging. For this reason, Merritt says, he is always strict about following the exact guidelines manufacturers list for equipment. A few weeks ago he cut up a couple thousand dollars’ worth of harnesses because it had been 38 months since their first use and the manufacturer recommended a lifespan of three years. Chopping them up into little pieces ensured that no member of the team would accidentally utilize potentially faulty equipment. According to Merritt, if the concert organizers in Brazil had followed the safety precautions that are now universal in the states, this latest tragedy could have been avoided. According to Merritt, Elite Multimedia has a strict rigging safety plan in place. There is an extensive review of the structural drawings of a stage beforehand, meaning technicians know the type of weight the location can be expected to hold. They also maintain close inspections of equipment and ensure that all our climber and technicians are trained according to OSHA guidelines. In every area of preparation for an event, they make sure that no corners are cut so that the safety of everyone, from attendees to the tech staff to the performers themselves, are as safe as possible.